Went to the Uintahs on Saturday with my good friends Becca & Julie. Between the 3 of us we had 5 dogs: Abbie, Molly, Lady, Timbre & Day-Z. It was a great day: 10 mile hike around Crystal Lake, getting lost for a short time, watching the dogs run themselves to exhaustion and a great picnic lunch. 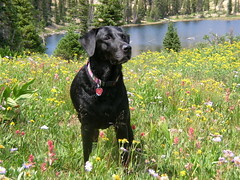 This is a photo I took of Abbie in the meadow above the lake we had our picnic. I’m not much of a photographer, but I think this photo turned out pretty good. Look through my pics to see more of our day.